Jersey Reds put paid to Doncaster Knights’ hopes of ending the 2017-18 campaign with some silverware. Reflecting on the club’s 22-10 B&I Cup quarter-final defeat in St Peter, director of rugby Clive Griffiths said: “I’m disappointed we are out of the competition because I wanted to give the town another big game and Leinster A in the semi-final would have fitted the bill. Although Jersey led throughout Griffiths said: “I don’t think that there was that much between the two teams but they took their chances and we didn’t. “I’ve also got an issue again over some of the decisions and with 75 minutes gone the penalty count was 14-6 against us and it’s hard to win with those sort of figures. “Decisions have gone against us for much of the season but we are also contributing to our own downfall by our own mistakes. 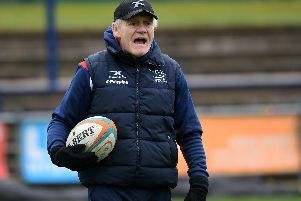 “It was 7-0 just before the break and we’d have been happy with that - even though I felt that Mat Clark was obstructed in the build-up to the try - but they scored a second just before half time from a speculative kick to the in-goal area which Charlie Foley fumbled. “The boys said it was a knock-on but it was given and that made it 12-0. “We’d had a good chance earlier in the half but the backs blew it. Had we scored it it would have made it 7-7 and it would have been a huge psychological boost.